Artwork being revealed for the first time will include virtually every medium—watercolor to oil, bronze, marble and metal sculpture, blown glass to cast, jewelry to ceramics, furniture and wearable art. Cannon Beach visitors who have attended this event in the past have said they really enjoy being able to visit one-on-one with the artists, while watching many of them at work on a new piece. Also included for the third year is “Art from the Chef’s Table” with nearly thirty local chefs selecting artwork from the galleries as their theme for creating special menu items offered only during the weekend. Archimedes Gallery: Themed show: Dubious Beasts: Symbiosis with Leslie Levings and Shing Yin Khor. Also introducing Frank Gonzales, a leader of the Young American Realist movement. Bronze Coast Gallery: Animal sculptors Rosetta and Melissa Cooper, along with Nathan Bennett who is known for using the patina process on bronze plates as his canvas. 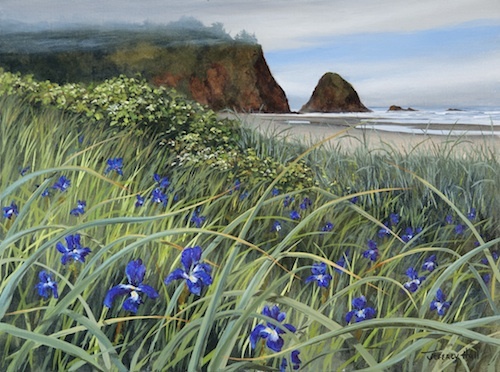 Cannon Beach Art Gallery: A themed show: “Northwest Nouveau” bringing together the new and diverse works of four exciting Portland women artists: Jean Erhardt, Catherine Kumliln Gamblin, Jean Rosenbaum and Sandy Sampson. DragonFire Gallery: A themed “Garden Party” group show including many of the gallery’s artists…with each submitting their version of “garden art” to the party….ranging from entry gates to blown glass blossoms. George Vetter FotoArt: New images from Cannon Beach’s resident photographer. O’Neill and new paintings by Bart DeGraaf. Icefire Glassworks: Glass blowers Jim Kingwell, Suzanne Kindland, and Mark Gordon and jeweler Pamela Juett demonstrating all weekend. Jeffrey Hull Gallery: New watercolors from this artist who has been capturing the beauty of the North Oregon Coast for more than 40 years. Jewelry by Sharon Amber: Highly original fine jewelry inspired by nature and the constant motion of the waves. Modern Villa Gallery: Featuring new California artists to the gallery, Tom Scheibal and Tom Henderson, along with new work by David Jonathan Marshall. Northwest By Northwest Gallery: Showcasing noted bonze sculptor Georgia Gerber, master fine art photographer Christopher Burkett, and the landscapes and pointillist oil paintings by Jeff White. Primary Elements Gallery: New work by sculptor Greg Congleton, furniture designer Jeffrey Mann, and new artists to the gallery H Leung & Thomas Leung from China. White Bird Gallery: Well-known Oregon artist Deborah DeWit, along with Eric Boos who will introduce his “Almost Edible Ceramics” series, and Helga Winter who uses the pages from books to create her unusual sculptural paintings. For more information about the individual artists, please contact the galleries listed on the website.